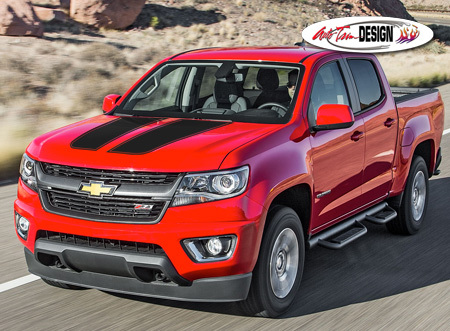 Make your '15-Current Chevrolet Colorado "Tough-looking" with this Rally Stripe hood and optional tailgate graphic kit. This easy-to-install kit is packaged as a set of two (2) pieces with a classic 3/8" (9.525mm) pinstripe at the outside perimeter as shown. They're PRECUT and ready to install in a wide variety of colors - NO TRIMMING required! This stripe package is not just a set of straight stripes in a box. Our graphic kit consists of pre-fit and contoured pieces as shown in the illustration. 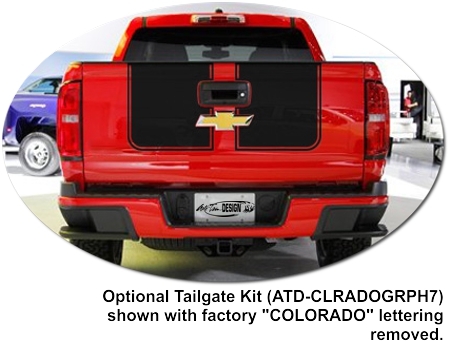 This kit is specifically made for the '15-Current Chevrolet Colorado and will not fit any other vehicle. Rally stripes are set for 4" (10.16cm) center spacing at time of installation. Comments: I installed this rally stripe set with the tailgate stripes onto my 2015 Colorado and the quality is unbelievable. I''m getting lots of likes on Facebook after I posted pictures. I ordered the silver metallic set to be put onto my laser blue truck.